Statistically speaking not every depressed person thinks about suicide but almost every suicide attempt is by someone that could be diagnosed with depression. Suicide attempts considered a cry for help or a feeling of hopelessness or or an ending to the never ending nightmare or several different reasons. If you are considering suicide as an option please get immediate one-on-one counseling. If you are in immediate danger, check yourself into a psychiatric ward at the hospital. One thing to consider is not every person that says, “I wish I were dead,” is suicidal. Sometimes the term is hyperbole for an extreme feeling. Unfortunately, hard to know which it is for someone else. However, you can know for yourself if you are contemplating suicide or expressing frustration over current circumstances. Depression is a major risk factor for suicide. The deep despair and hopelessness that goes along with depression can make suicide feel like the only way to escape the pain. Thoughts of death or suicide are a serious symptom of depression, so take any suicidal talk or behavior seriously. It’s not just a warning sign that the person is thinking about suicide: it’s a cry for help. When you’re feeling extremely depressed or suicidal, problems don’t seem temporary—they seem overwhelming and permanent. But with time, you will feel better, especially if you reach out for help. If you are feeling suicidal, know that there are many people who want to support you during this difficult time, so please reach out for help! Read Feeling Suicidal? or call 1-800-273-TALK now! Life contracts: A life contract is an agreement to call or get help from someone when feeling there are no other options. Getting help offers more choices. S: Social support — does the person have social support? Someone with little or no social support is at higher risk. L: Lethality — If the person has a plan, how lethal is the method? A gun is more lethal than a pill overdose. A: Access — This is access to the method. Does the person have the pills or would they have to get them? Do they have the bullets or would they have to stop by wal-mart? P: Plan/previous attempts — Does the person have a plan about how they would kill themselves, or just some vague notion that it might be better if they were dead? People with a specific plan or who have previously attempted suicide are at higher risk. D – I – R – T~ An assessment of the past suicide attempt. D – Dangerousness – the greater the dangerousness in the attempt. I – Intent – If she honestly believed that she would die, then the present risk is higher. R – Rescue – If she aided in her own rescue in any way, even at the last minute, then the present risk is lower. Note: Any unexplainable deviation from an ingrained behavioral pattern or sudden unexplainable recovery from a severe depression. S – L – A – P ~ An assessment of the degree of risk. After you realize the person is at risk, assess the degree of risk. Always begin an assessment with “how?”, i.e., “How would you harm or kill yourself?” If the person has a plan of attack, use the acronym SLAP. L – Lethality – level of the proposed method. A – Availability – of the proposed method. P – Proximity – of helping resources. Note: This approach may not be a reliable technique with alcoholics, drug addicts, psychotics, or others with highly impulsive personalities. Learn your choices. If you can’t see them for yourself, get help from a counselor or psychiatrist that can teach you to see your choices. You deserve to live. Find a thread of thought that sustains you across dark patches of suicidal depression. A single reason to live can keep a person going when things seem hopeless. A single candle in a dark room makes a difference. Believe in that difference. 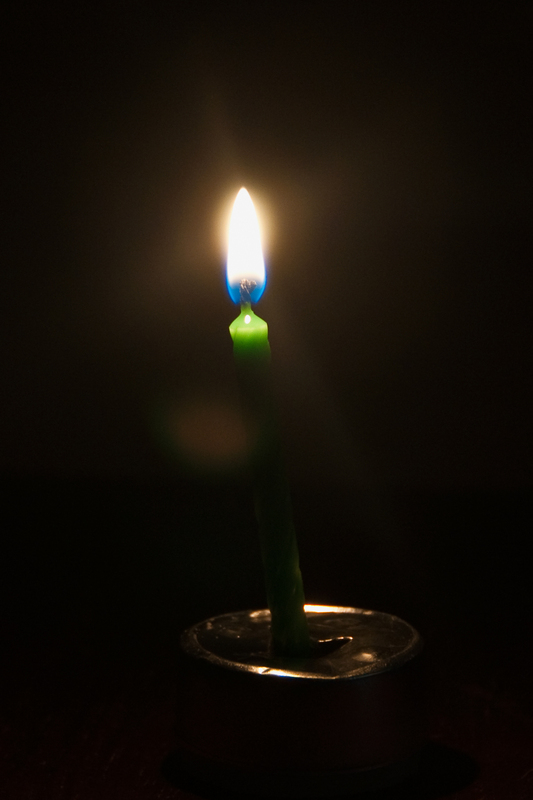 A single candle brings light to the darkest room. Not until we recognize we are lost do we go looking. Pingback: SLAP DIRT | Tales of . . . I appreciate you passing on information that hopefully will help others. That is my hope as well.